(CNN)–February is Black History Month. February is also National Pie Month. What could one possibly have to do with the other, you might ask? 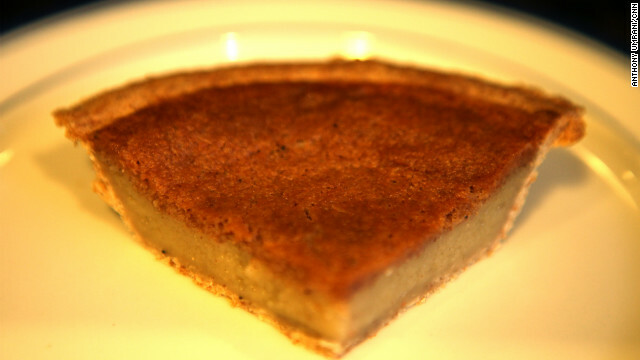 Meet the bean pie – a sweet, delectable dessert made from navy beans. The bean pie is a creation born out of the strict dietary code of the Nation of Islam, a religious black nationalist and social reform movement formed in the 1930s, led by Elijah Muhammad. In his book, "How To Eat To Live," Muhammad outlined a rather detailed and sometimes peculiar set of guidelines for eating, presumably designed to improve health and prolong life. In accordance with Islamic law, pork was prohibited, but there was a list of other banned foods that could not be explained by any Islamic jurisprudence. Foods such as spinach, sweet potatoes and lima beans, which many nutritionists would agree are good healthy foods, were not allowed. If you want to know what happens when Judaism goes bad; I give you Islam. One of the most evil religions on planet earth. They kill innocent and their own people and have the audacity to believe they are doing it for God! Sir Arthur Conan Doyle, B.A., J.D., S.P.J. Perhaps all we need to promote interfaith understanding is to invite religoius leaders to a Chili cook-off in Texas and let them fart and fart and fart. Hot-air, and funny smells is a common ingredient in all religions! That's why they have those incence burners in the Vatican. Can you imagine what fresh pesto and garlic can do for a room of Italian Cardinals? Queen Elizabeth is the head of the Church of England. Once she let out this big fart during an interview at Tea at Buckingham Palace. Apparently Protestants can fart, and it's the watercress sandwiches on white bread with the crusts cut-off that causes it! Perhaps we could attempt to rehabilitate Al Quaeda and teach them to sell bean pies and newspapers to cars at freeway on-ramps? Perhaps if we exported enough beans and molasses to Afghanistan, this fiasco would be over. Beans are good. I like beans. Best response ever! Thanks for the smile. "What could one possibly have to do with the other?" "If one ever has the opportunity to taste a bean pie, it's worth making a connection to acquire another one in the future. There’s nothing more frustrating than needing a bean pie fix, and having no supplier." Ahh, more drug references... something that the NOI can identify with. What next, are bean pie eaters in withdrawal? Bean pie eaters unjustly incarcerated? Discrimination against victims of the bean pie? The NOI is a separatist, reprehensible organization. This is a new low for CNN. Your prejudice is showing, BG. How Christian of you. And Christian millennialism under the Nazis "only" killed 6 million so I suppose that makes it good? That was Stalinist communism that caused those deaths, not the atheism. Similarly, Christianity is not responsible for the Nazi mass murder, despite the significant use of God to support their ideas. Gott Mit Uns. Here is the absurd fallacy of your logic at work in another obvioous example: Stalin and Hitler has funny moustaches. Stalin and Hitler mass-murdered millions. Therefore, people with moustaches mass murder millions. National Socialism, Nazi was atheistic in the extreme. Nazi was it's own "religion" with Der Furher as its god. Adolf Hitler was not a Christian, his commitments to the Catholic church were no more sincere than his commitment to Czechoslovakia. Adolf Hitler was an atheist.The dead of the World War and the camps was the work of atheism. Prove that atheism was the CAUSE of these atrocities, you moron. There's no evidence it was. Hitler was a devout catholic, the whole atheism tiff was american propaganda. Christianity was the official faith of nazi germany as roman catholicism was in italy and Spain, no amount of historical revisionism can change fact. Do some research before you post about history. From a german-american. If you doubt the faith of butler ask a neo- nazi. Atheism is a product of christianity. Wherever in the world you find christians, you also find atheists by the truckloads. Notice atheist communism was a product of christian europe. So saying that atheism killed 6 million jews and 24 million russians is the same as saying christianity killed 6 million jews or 24 million russians. Hitler was raised in a catholic household and stalin was raised in a montesory where he was studying to be a priest. they both rejected christianity and became atheists. What does not believing in a deity have anything to do with those horrific murders? This is a dumb argument because it's always over political power when mass murders happen by political figures. Blame communism in general not atheism. Atheism removes the moral restraint in 'thou shalt not kill' (murder). Without conscience or consequence an atheist in power is free to express the most inmost evils of atheism. Tying atheism directly to the millions murdered. just sayin, I have to admit that I've never noticed "Thou shalt not kill" stopping any religion anywhere from endorsing or even promoting the killing of non-believers or other social or political enemies of the faith. These days I believe the Christians like to call it "justified killing"; previously it was things like "purifying the faith" (as with the various Inquisitions), "Holy War" and "Crusade." It seems to me that the atheists actually have the moral high ground here: you'll never find an atheist claiming that somehow God's rules justify doing something that God (under whatever name) has absolutely and unequivocally forbidden. Of course the atheist will kill you just as dead as the Christian if you happen to get in the way of their big picture utopian City-on-the-Hill social plans but at least they won't be hypocritical about it. Do be a sweetie and read some of the posts before commenting, atheists have been responsible for countless millions of murders in the last 100 years alone. "Farting is problematic in Islam. During prayer, a worshipper must not fart. Sahih Bukhari (1.4.137) writes that Allah will not accept a Muslim's prayer if he/she passes wind during the ritual. The exception occurs if the worshipper farts silently, or the fart does not smell. In such a case, he/she may continue with the prayer (ibid, 1.4.139).Sunaan Nasai (1.162) writes that if you fart during a prayer you must redo ablution. Sahih Bukhari (9.86.86) says that for a "farter" Allah will not accept his/her prayer until he/she performs another ablution." I have always enjoyed eating the bean pie. Since the 30's this sweet, delectable dessert made from navy beans has been my favourite.Although in accordance with our Islamic law, pork is prohibited and there is a list of other banned foods, I would have to agree that the bean pie tops it all in nutrition and health. I love my Islamic bean pie. "controlling farting" is a good thing. good manners not be farting while you are praying with others next to you or having dinner with friends or neighbors. Best to fart when alone or in the washroom. But this is for muslims, for reality, i suppose farting in the middle of his friends and family is OK. They are all smelly Godless people anyway, whats a few farts from Reality going to make things any more stenchful. Nothing worse than finding an IDF unit patch in your bean pie! Its really nothing more than Hallal Soylent Green. Damn you ! Damn you all to hell !! Wait.. sorry – wrong Charlton Heston movie. I like beans too – but they don't like me. I've been saying for six or seven years now (four of those spent adnitcnujg post-degree) that I could and should be looking for work outside of academia, but only after five rollercoaster years on the academic market and coming *this close* to landing a tenure-track position can I happily and healthily say I quit. The brainwashing that goes on in graduate departments may not be a conspiracy, as some of the commenters say, but that doesn't mean the brainwashing doesn't occur nevertheless.Also, I can't stand that UM English still has me listed as having been placed at Trinity as if it were a TT job. Bull. I'm an adjunct working at my undergrad alma mater. I loathe their misrepresentations of job placement, I am angry that they won't change it even after I complained about it to various chairs/secretaries/Web designers there three years in a row, and I know for a fact that many of the other listings are just as bogus. I don't blame the department for my lack of a job, but I do hold them accountable for being honest in their self-representations to prospective students! I love their Bean Pie's, Don't care for their Politics much. It's the 535 members of the United States Atheists. The same group of Idiots that crank out hundreds of new ideas each year designed to keep the rest of us in line. Trolling faith forums is what noobs do to learn how to be better trolls. But then again, you're posts are not really refined or good, so I suppose you're in the right place. Let me give you a tip, artisan trolling walks the very thin line between ridiculousness and credibility. You have to have people believe you're actually thinking the nonsense you're spewing. You need to work on that. You're a poor troll. Decent trolls never copypasta. Supply your source for those statistics. I googled it and there is absolutely no support for it on the internet. All available studies show atheists to commit significantly less crime than religious people. My ex wifes hips used to copypasta! Atheists commiting less crime can easily be a function of percentage population. You are not very bright, Nii. Atheists commit less crime per capita. Any little research that you might have done would prove that. Do you need a definition of per capita? In monosyllables? I don't have much to say on this. I have not eaten Islamic Bean Pie. It's really quite good. The flavour explodes in your mouth. sort of like how the oil we import from the middle east moslems explodes in our gas tanks. you know what i mean. or like the trillions in weapons we sell them explode. wink wink.